Joseph's Grainery: UPDATE: Whole Grain Flours Coming Soon! UPDATE: Whole Grain Flours Coming Soon! You won't have to wait too much longer for our NEW Whole Grain Flours. Our commercial kitchen is complete and it has "passed" it's initial inspection. Just a few steps to go! 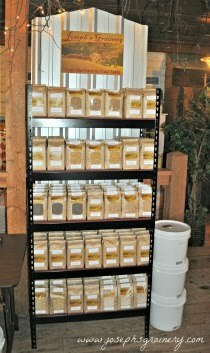 Keep watching the side bar here at JosephsGrainery.com, once we are ready to start taking orders for fresh ground flour, you'll see them there. Joseph's Grainery Soft White Whole Wheat Flour - great for cakes, pastries and noodles, sometimes called "pastry flour". Joseph's Grainery Hard Red Whole Wheat Flour - considered your classic "whole wheat flour", works fantastic for baking breads. Joseph's Grainery Barley Flour - we'll be featuring lots of recipes using Barley Flour! Joseph's Graineyr Lentil Flour - a fun flour to experiment with. We'll be featuring creative recipes with this new flour as well. We're excited to expand our product line and hope that you are looking forward to baking with Joseph's Grainery Whole Grain Flours!